Rock Climbing is a challenging an exciting sport. Sport England describes rock climbing as one of the greatest challenges of human strength, skill and endurance and one of the most rewarding sporting activities. 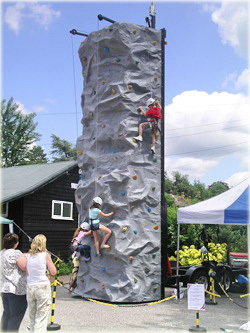 Our Mobile Rock Climbing Tower is 8m tall (24ft) and suitable for many events. We have created the routes on our Mobile Climbing Tower to cater for all ability climbers. There is something for those who have never climbed before and those who are experienced rock climbers. Our Rock Climbing Tower has a combination of grit and granite holds to offer the most realistic feel for climbing on a Mobile Rock Climbing Tower. Our Mobile Rock Climbing Tower can be used by four people at one time and is suitable for climbers weighing between 23kg (3.5 stone) and 114kg (18 stone). Hydraulic auto belays are used to safely control the decent of the climbers. The Mobile Climbing Tower can be set up on a firm surface (grass or hard standing) and can be ready in minutes as it arrives on a portable trailer. 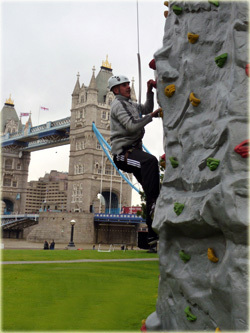 We always provide staff to operate our climbing wall to ensure the activity is run smoothly and safely for your event. Our staff are fully trained, have enhanced CRB disclosures and a first aid trained operator will be present at your event. We always provide harnesses and helmets for participants to wear and these are included in our prices, there are no hidden extras! Users must weigh between 3.5 stone and 18 stone and safely fit into a harness.